Antonis, Yourkas, Takis, Michael, Traianos, Thodoris, Angelos, Costis, Zisis, Angelos, Demis, Dimitris, Stelios, Yannis, Costas, Pandelis, Fanis, George, Nikos, Vassilis, George, Vassilis, Stelios, Otto, Yannis. 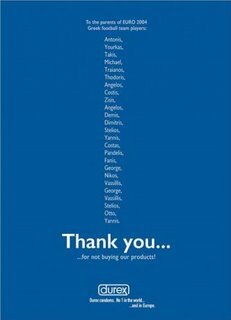 Thank you……for not buying our products! 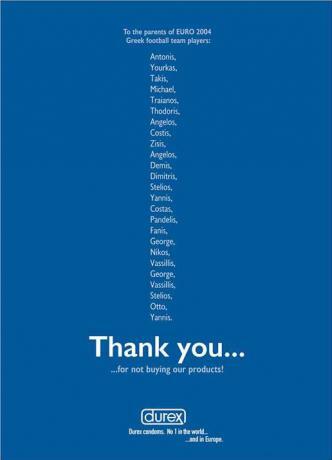 Durex condoms. No 1 in the world……and in Europe.